That’s how we started the Ranchweb blog three years ago this fall. Today, the blog and the Ranchweb home site that the blog springs from still anchors our place in new media. But recently we launched a Facebook page that opens up another door of communications between Ranchweb members and those who love ranches and are eager to know more about them. The latest hot info about them. Celebrate autumn at this luxury ranch, set in eastern Arizona’s White Mountains and bordered by majestic national forest. Near the historic town of Greer, Hidden Meadow Ranch is an escape from urban life—a peaceful retreat for relaxing in a hammock under the whispering pines or for reveling in the wonders of nature. At 8,500 feet, the aspen are turning fast. 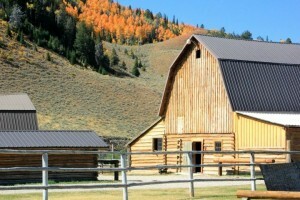 Just east of Yosemite National Park in the lush Bridgeport Valley, the Hunewill Ranch is a family-owned and operated. Here, the big attraction is great horseback riding. Ride through shimmering groves of aspen. Bring your rod and reel: streams and lakes in the beautiful Bridgeport Valley offer an angler’s paradise. Or kick back in the evening with cookouts, roping lessons, hayrides, some bingo, square and round dancing, campfires and sing alongs. Its fun the old fashioned way. Enjoy the unspoiled scenery in the remote White River National Forest of northwestern Colorado. This year-round resort fall colors mid September into early October (hurry!) from groves of quaking aspen. The ranch is also open for hunting season, September thru November. Details: after Labor Day, low season rates apply. “Full American Plan includes all lodging, meals, horseback riding, swimming, hiking, children’s programs, trout fishing (in our private lake), and all evening activities. For a 6-Night stay: Arrive Sunday after 3pm and depart Saturday by 1pm after lunch. Fall is for fly fishing at Red Rock. The ranch is home to over 2.5 miles of private fly fishing water. Crystal Creek flows through the Red Rock Ranch, and it’s a famous fishery, noted for abundant native Snake River (Fine Spotted) Cutthroat Trout. Angling on the private waters of Crystal Creek is for fly fishing/catch and release only with barbless hooks. The ranch offers a guide service with local fishing experts who know the subtleties of this stretch of water (please book fly fishing guides in advance; service rate can be added to your final billing). Details: The weekly all-inclusive per person rates include cabin accommodations (keeping an authentic western ranch feel), a private sitting area and sun porch, all ranch meals and snacks, complimentary house beer and wine during nightly cocktail hour and through dinner service, ranch activities, horseback riding, kids program and fly fishing on stocked ponds. The rates for a six-night all-inclusive vacation (Sunday through Saturday) are: Adults 13 yrs. and older – $1,925; Children 6-12 yrs. – $1,425. Whether you’re at a restaurant, on a cruise ship, or visiting a guest ranch, knowing just how to tip can make you look like a sophisiticated world traveler…or a rube just off the boat. First, policies vary depending on the ranch, so you won’t be out of line by asking about tipping policies when you book your reservations. At one time, rates usually didn’t include gratuities, but that is changing. Some ranches now add on a gratuity of about 16 percent (of your total bill) ‘for your convenience’ and are up front about it when you book. But do ask: an intimate, family-run ranch might have very different attitudes about tipping than a large, complex ranch. Also, when you book outside excursions, you’re often expected to tip the outside guides (such as raft operators, fishing guides) directly (but ask ahead). Same goes for special services at the ranch, like a spa treatment; in that case, figure 15 percent as a base. A mid-sized, family run ranch (capacity 50-55 guests), Tumbling River Ranch is best known for it’s fun-filled children’s and family programs. But the big news, say co-owners Scott and Megan Dugan, is in their shoulder seasons. “We’ve been really expanding our wedding offerings–just in the spring and fall–since we built a new Recreation Hall,” says Scott. “That gave us the space and options to hold events like weddings. Each wedding takes over the whole ranch, so wedding guests have their privacy. What makes a ranch a good choice as a venue for nuptials? “It’s a destination wedding-so guests who come here get a mini-vacation, too. That’s nice for everyone,” notes Scott. “We don’t do it during our normal dude ranch season, so it doesn’t intrude on other guests,” notes Scott. And the new red hall has created a better venue for the ranch’s evening programs during dude ranch season: live music, square dancing, and such. So if you’ve got nuptials pending, consider heading for Tumbling River Ranch. “We’re on Guanella Pass, on the Front Range, about an hour from Denver, comments Scott. Details: They’re open for weddings the last week in June and first week in Aug thru September (and may expand into October).